Lady Elizabeth Herbert was buried in St George’s Chapel in around 1507. She had been a ward of King Henry VII as a young woman when, after her father’s death in 1490, she inherited his barony and extensive lands in Wales. In 1492 she was married to Charles Somerset; she was sixteen and he was thirty-two. From rather inauspicious beginnings – his father, Henry Beaufort 3rd Duke of Somerset, was executed by Yorkists in 1464 and Charles, only a small child at the time, was his illegitimate son and only child by the otherwise unknown Joan Hill – Charles Somerset went on to rise high in the Tudor court. His grandfather was the brother of King Henry VII’s grandfather and after the Wars of the Roses there were very few male heirs of the Beaufort line surviving and so this connection took on greater significance than it might have done in other circumstances. In 1485 he was made a Privy Councillor and later held positions including Captain of the Guard and Knight of the Body. In 1501 he became Vice-Chamberlain and then in 1508 Lord Chamberlain, which office he held for life after 1514. In this role he was involved in making arrangements for the meeting between King Henry VIII and Francis I of France at the Field of the Cloth of Gold in 1520. In 1504 he had been created Baron Herbert, claiming the title through his wife, and in 1514 Henry VIII created him first Earl of Worcester in the fifth creation of that title. The Garter, symbol of Somerset’s appointment in 1499 to the noble Order based at Windsor, is clearly visible on his effigy, buckled just below the left knee. He also wears the mantel and collar of the Order. From 1523 Somerset held the role of Chancellor of the Order of the Garter, responsible for keeping and supervising the use of the seal and signet of the Order. The burial place of Charles Somerset and Elizabeth Herbert is in the south-west corner of St George’s Chapel, known as the Beaufort Chantry Chapel. They secured permission for this in 1506 and, although the original document no longer exists, a sixteenth century transcript of the agreement can be found in the St George’s Chapel Archives [SGC IV.B.3]. The chapel had already been built and previously dedicated to the Virgin Mary, but Lord and Lady Herbert agreed to pay for all fittings and running costs. This included their Purbeck marble tomb with two alabaster effigies, as pictured above, and the wages of a chantry priest, whose role was to say daily masses and prayers within the chapel for the prosperity of Lord and Lady Herbert during their lifetime and for their souls after their deaths. Lord and Lady Herbert provided their chantry chapel with a chalice and paten, two cruets, a super-altar, two missals, one breviary in two volumes, a psalter, two candle-sticks, a sacring bell and a holy water stock as well as vestments for the priest and the altar. 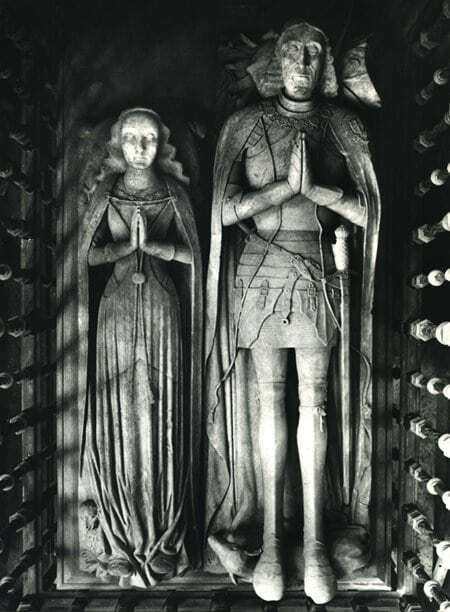 The alabaster effigies of Lord and Lady Herbert, which lie on top of their tomb, are pictured here. In the carvings Elizabeth Herbert is 5 feet 10½ inches but her figure looks miniscule in comparison to that of Charles who lies out at a full seven feet tall. The tomb was originally placed in the centre of the chantry chapel. However, in 1699 a much larger monument was erected for the first Duke of Beaufort, a descendant of the Herberts, and the original tomb had to be moved to the west wall. The Duke of Beaufort’s tomb did not remain at St George’s, being removed to Badminton church in Gloucestershire in 1874, but it did have a lasting impact as to this day the chapel is known as the Beaufort chantry chapel.